Goldman Sachs says investors have been getting increasingly wary of tightening corporate profit margins. The firm’s response: don’t worry about it. The measure in question is National Institute of Pension Administrators (NIPA) profit margin — a piece of data calculated by the government that’s fallen to 10.6% as of first quarter 2017, down from 12.3% two years prior. Goldman says that it’s attracted the attention of traders and made some sceptical of what’s historically been the biggest driver of stock gains: earnings growth. But the data isn’t as bad as it looks upon closer examination. 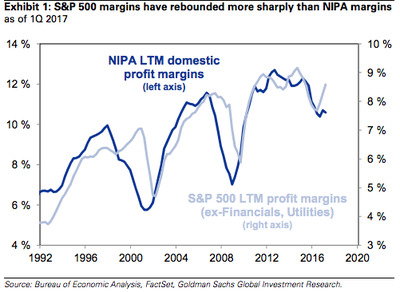 Goldman SachsS&P 500 margins are looking more robust than their NIPA counterparts. First and foremost, the NIPA figure includes private companies in addition to their public counterparts. It also measures smaller firms that tend to be less profitable and have no effect on major stock indices, Goldman says. The firm also points out that NIPA profits are more heavily weighted towards sectors like legal and medical services, a far cry from the high-margin tech companies that rule the S&P 500 and dictate so much broad trading. To Goldman, S&P 500 return on equity (ROE) serves a better indicator for profitability — and it looks to be in good shape. The measure improved for a third straight period in the first quarter, hitting 14.9%. Another measure of corporate profit — simple year-over-year earnings growth — is showing signs of strength. The S&P 500 is expected to expand profits by 7.3% in the second quarter, which would mark its fourth straight period of expansion, according to data compiled by Bloomberg.